Eddy Curry sure went from franchise player to benchwarmer pretty darn quick. Nice to know the Knicks gave away two lottery picks for a guy who’s not even getting playing time. And paying him $56 million to boot. So let me get this straight. Isiah has Curry, yet deals for Zach Randolph, then 20 games into the season, determines they can’t play together. Do you think maybe he could have figured that out before the trade? Just another day at the Garden. Just a hunch, but it appears the Shaq act may have run its course. Trading away speed and athletic ability for size and muscle is not always a good thing. Elsewhere in the West, Jason Kidd may finally give the Mavs enough to get over the hump and win the title they should have won two years ago. Jack Nicklaus not only won 18 majors, he finished second 19 times. If he had won a few of those, his record might be out of reach, even for Tiger. Thirteen of those seconds were by two strokes or fewer. Seven of them occurred at the British Open. Tiger has 13 wins in the majors — but only four second place finishes. The Mets acquisition of Johan Santana has turned the talk of the town from el foldo to el ace. Mark it down, if he stays healthy Santana is a lock to win 20 games throwing against watered-down National League lineups in a pitchers park.. Check out these numbers after four years in the league. Namath threw 23 more interceptions and had a lower passing percentage than Manning…but those stats are also products of the times when the two QBs played. Defensive backs had more liberties in the late ’60s than they do today. 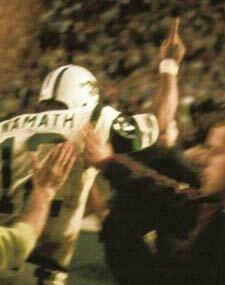 The games played and touchdown totals are nearly identical, Namath has an edge in passing yards. 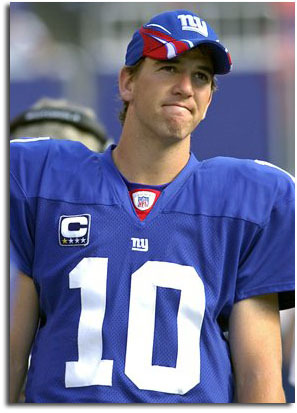 Makes you wonder, how will Eli’s career play out. 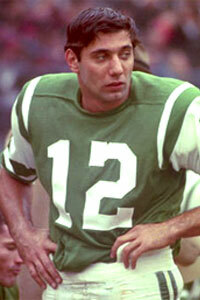 Namath played eight more years with Jets and wound up his career in Los Angeles in 1977 with the Rams. He completed just over 50 percent of his passes, throwing for 173 TDs and more than 27,000 yards with 220 interceptions. He was voted to the Hall of Fame in 1985. Joe Willie never won another Super Bowl — never even came close — but today nearly 40 years after that famous upset of the Colts in Super Bowl III, he’s still revered in sports circles and especially in New York, where he’s got the golden lifetime pass. The future’s uncertain for Eli, but after four years he’s in mighty good company. Really now, just how bad were the 1962 New York Mets? Pretty darn bad. The Mets, an expansion team in the National League along with the Houston Colt 45s, had a rather inauspicious debut. After half the team got stuck in an elevator at the Chase Hotel in St. Louis, the Mets lost their inaugural game to the Cardinals 11-4. They proceeded to lose their first nine before beating the Pirates. The Mets later had losing streaks of 11, 13 and 17 games….and they were 40-70 in their other games en route to a 40-120 record, setting the record for most losses by a single team in a single season in the 20th Century. Only the Cleveland Spiders, who went 20-134 in 1899, ever lost more games in a season. 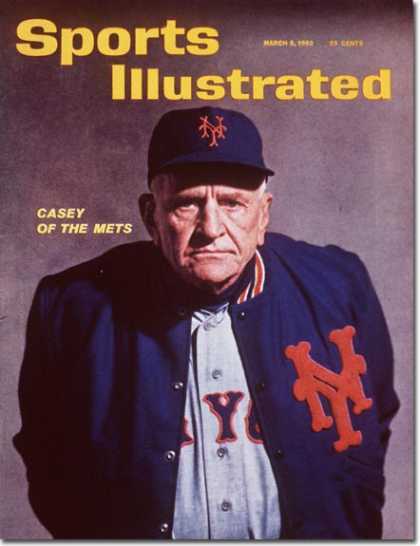 The Mets were managed by the lovable Casey Stengel, who led to Yankees to 10 pennants and seven World Series in 12 years before being fired after the 1960 World Series. “I just know I’ll never make the mistake of being 70 again,” he is reputed to have said after the Yanks dismissed him. Early on, it was apparent the Mets were going to have trouble competing in the National League. “Been in this game one-hundred years, but I see new ways to lose ’em I never knew existed before,” said Casey after one particularly disheartening loss.” “Can’t anybody here play this game?” he asked after another setback, a phrase that Jimmy Breslin later used as the title for perhaps the best book about the 1962 Mets. The relaxed Mets won a total of 11 games in the last two months, and finished in 10th place, a mere 60 1/2 games behind the pennant-winning San Francisco Giants. 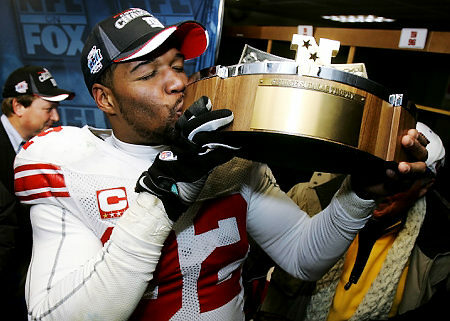 There was a lot of banter and cocktail talk around Super Bowl XLII and its ranking among the list of all-time upsets. The “Miracle on Ice,” Team USA’s stunning 4-3 victory over the Soviet Union in the 1980 Olympics at Lake Placid is generally considered the greatest upset in sports history, at least in American sports. In college football, some pundits look to tiny Centre College’s 6-0 victory over Harvard in 1921 as the tops. The New York Times called the win by the Praying Colonels “arguably the upset of the century in college football.” Another huge surprise was Appalachian State’s 34-32 win over Michigan in Ann Arbor in the opening game of the 2007 season. Later that same season, Stanford, a 41-point dog, shocked USC 24-23. The Miracle Mets of 1969 rank high on the upset meter, mainly because a team that had finished last five times in its first seven years rose up, won the pennant and then smacked down the powerful Baltimore Orioles in the World Series. Bill Mazeroski’s ninth-inning home run helped the Pirates knock off the Yankees in 1960, despite losing three games by scores of 10-0, 12-0, and 16-3. Some might consider the Red Sox win over the Yankees in 2004 after being down 3-0, but that’s probably more of a great comeback than a great upset. Chaminade’s stunner over Ralph Sampson and Virginia in Hawaii, Villanova’s win over Patrick Ewing and Georgetown and North Carolina State’s win over Houston’s Phil Slamma Jam unit are among the major wowsers in college basketball. Buster Douglas was a 42-1 underdog when he pummeled Mike Tyson and eventually knocked him out in the 10th round of their heavyweight championship bout in Tokyo in 1990. In a race that introduced the word “upset” to the sports vernacular, Upset, a 100-1 longshot by some accounts, handed the legendary Man o’ War his only defeat in 21 races in the Sanford Memorial at Saratoga in 1919. The Jets are 17-point underdogs coming in but Joe Namath guarantees victory. The AFL gains instant credibility with a convincing win over the once-beaten Colts. The 10-6 Giants, a number five seed and 12-point underdog, rally in the final minute to upend previously unbeaten (18-0) New England and alter the course of NFL history. Chicago marches into Manhattan 13-0 with a record-setting offense, but the 8-5 Giants rally in the second half for an improbable victory in the “Sneakers Game.”. St. Louis, the proclaimed “Greatest Show on Turf,” comes in a 14-point favorite, but New England prevails on Adam Vinatieri’s 48-yard field goal as time expires. The Bears came in undefeated, winners of the previous two NFL titles, including a stunning 73-0 win over Washington in 1940. None of that pedigree mattered in this shocker. Denver enters the game a 12-point underdog to Brett Favre and defending champion Green Bay, yet pulls off the victory to give John Elway his first Super Bowl ring. Sports Illustrated is so sure the Colts will win that the cover featuring Don Shula and Johnny Unitas is already in the can. But Gary Collins catches three TD passes as Cleveland wins. Despite the Jets win the year before, the AFL comes into the game a 10-point underdog. But Hank Stram’s Kansas City team handles Minnesota with relative ease. Once-beaten Cleveland comes in having won five consecutive championships (four in the old AAFC), but (8-4) Los Angeles brakes the run in the first televised title tilt. 10. 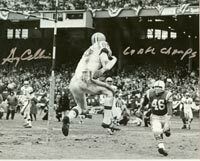 Texans 20, Oilers 17, 2OT, AFL Championship, 1962. Houston had already won the first two titles in the fledgling AFL. Despite a mix-up in the coin toss for overtime, Dallas prevails in one of the longest games in NFL history. Washington defeated Chicago 7-3 three weeks earlier, and after the game Redskins owner George Preston Marshall called the Bears “crybabies.” Payback has never been sweeter. Miami comes in with a perfect 16-0 record yet wearing the tag of a two-point underdog, The Dolphins finish off Washington, finish undefeated, and record the only perfect mark in NFL history. Studies have shown that the Monday after the Super Bowl is the least productive work day of the year in America. That should come as no surprise — the typical SB Monday worker is a partied-out, hung-over, bloated sports freak more concerned with touchdowns, turnovers and Super Bowl pools than deadlines, dollars and decisions. He should be home sleeping if off or watching Sports Center replays, not in the office, at the shop or behind the wheel. On this day, conference calls are for suckers. So, hear now, the Pigskin Party proposes a solution. A national holiday, Call it Presidents-Kings day, since it falls between the two holidays. Combine them, and then balance it out by adding an extra holiday in the summer when the weather is warmer, the grass greener, and the pool open. Make it the first Monday in August, and call it Dog Day. Don’t pass up this opportunity. Cast your ballots for the Pigskin Party. Come the first Monday in February 2009, you’ll be glad you did. There’s a problem with the NHL’s current system of awarding a team two points for a win and one point for an overtime or shootout loss. The way it stands now, a team that dominates a game and wins in regulation earns the same number of points as a team that wins in a gimmicky shootout. As a result, there are many instances where it benefits both teams on ice to settle for a regulation tie — each earning a point — then play for the extra point in overtime or the shootout. The solution — make each game worth three points. A team that wins in regulation gets the three points. If the contest goes into overtime, the winner receives two points and the loser one, same as now. Net, net, teams would get rewarded for solid performances, and the league could still generate the excitement of overtime and shootouts, which are fan favorites. Are you reading this Gary Bettman? In the storied 99-year history of the Montreal Canadiens, Les Habs had never before overcome a five-goal deficit to win. And in the eight somewhat less than legendary decades the New York Rangers have been playing hockey, the Blueshirts had never blown a five-goal lead and lost. Until the other night that is, when Montreal stormed back from 5-0 down to beat the Rangers 6-5 in a shootout. It remains to be seen what affect this game will have on the two teams. You know that motion Roger Clemens used when he threw the piece of shattered bat at Mike Piazza in the 2000 World Series. Is that the same motion he uses to throw people under the bus? And it’s getting pretty crowded under that bus by the way — Debbie Clemens, Andy Pettitte, Brian McNamee, the Hendricks brothers. We’re taking a readers survey — who’s telling the truth, Andy or Roger? Be honest now. Speaking of the truth, we can accuse Andy Pettitte of late honesty. If he had been a bit more forthcoming, a bit earlier, the Yanks may have had Johan Santana in their rotation. If you’re counting, 2008 marks the 100th anniversary of the Cubs last World Series title. One of the enduring moments of the NFL playoffs was Eli Manning running around the frozen field at Lambeau, looking for someone to hug. Shades of Jim Valvano, 1983. Was Tiki Barber that much of a distraction with the Giants? Maybe it’s more than mere coincidence that there are two “i’s” in Tiki and no “i’s” in team. Been to any good Knicks games lately? Oops, that’s an oxymoron — good Knicks. If the Knicks ever manage to win two in a row, Jimmy Dolan will be looking to re-up Isiah. Three straight and they’re talking playoffs at the Garden. I like the excitement of the NHL shootout, but it’s kinda like staging a home run derby if the game is tied after 10 innings.